https://sep.yimg.com/ay/yhst-33477391359232/arc-eye-hawkfish-paracirrhites-arcatus-arc-eye-hawk-fish-6.jpgArc-Eye Hawkfish - Paracirrhites arcatus - Arc Eye Hawk Fish EasyAggressive30 Gallon5.5 inchesYes, with CautionCarnivore, Pellet, Flake, BrineIndo-PacificCirrhitidaeSmall 1" - 2"
The Arc Eye Hawkfish, also known as Arc-Eyed Hawkfish, has an orange-colored body with a white horizontal bar on the back half. The operculum and eyes have the most distinctive markings, with an alternating blue and bright orange pattern. The Arc Eye Hawkfish has a horseshoe-shaped mark behind the eye that consists of three thin lines. There are three orange bands on a light blue area on the operculum. A white to pink stripe is often present along the lateral line on the rear of the fish. Each dorsal fin spine is tipped with cirrus. As with other hawkfish, such as the Falco's hawkfish, it has a voyeuristic nature. Lacking a swim bladder, the Arc Eye Hawkfish spend most of their time perched on corals, watching for prey, interrupted by an occasional sudden dash to another nearby vantage point. Hawkfishes should be the last fish introduced into the tank community. It becomes very territorial, and will harass new additions to the tank including other hawkfish and larger fish. If placed in a reef aquarium, the Arc Eye Hawkfish will eat crabs, shrimp, anemones, and smaller fish. The Arc-Eye Hawkfish can be identified by the arc of colors behind its eye; despite multiple possibilities for its body colors, that arc is unchanging. The Arc-Eye Hawkfish forms territorial harems, with one male defending a territory with multiple females and juveniles. The Arc eye Hawkfish, like other congeners, has multiple color Emorphs whose relative abundances vary greatly among geographic locations. Maximum Size: This species grows to 14 cm in length. General Size: This Arc Eyed hawkfish is about two inches (5 cm) in length. Minimum Tank Size Suggested: A 30 gallon or larger aquarium provides a good environment for these Arc Eye Hawkfishes. Tank Conditions: The Arc Eye Hawkfish should ideally be kept in temperatures between 71 and 74 degrees Fahrenheit. A pH value of 8.3 or 8.4, and a specific gravity of 1.020 to 1.025 should be maintained. When kept with invertebrates, the specific gravity range should be 1.023 to 1.025, for the invertebrate species. In a fish only aquarium, the specific gravity should fall between 1.020 and 1.023. 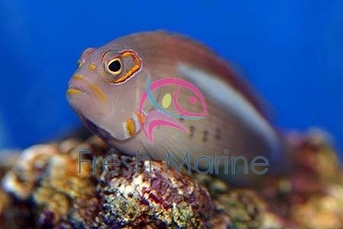 Habitat: The Arc Eye Hawkfish occurs on coral reefs in tropical marine waters of the Indo-Pacific. In Australia, the Arc Eye Hawkfish is known from central to north-western Western Australia and from the entire length of the Great Barrier Reef south to northern New South Wales. Feeding and Diet: Carnivorous, feeds on bottom-dwelling invertebrates and zooplankton. Provide a varied diet including preparations for carnivores.